Evidence of Ancient ETs on Earth - Is This Artifact a Sculpted Scale Model of a Rocketship? Is this a replica (above images) of an ancient single-seat rocket-ship? 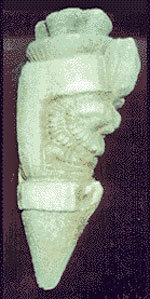 That’s what it looks like to Zecharia Sitchin, the leading authority and scholar on the Ancient Astronaut theory. Hidden away in the Istanbul Archaeology Museum in Turkey for a quarter of a century, Sitchin recently convinced the Museum that this artifact may indeed be ancient, and not the modern forgery they concluded it must be, simply because our current view of our ancient history doesn’t include rocket-ships. "a sculpted scale model of what, to modern eyes, looks like a cone-nosed rocket-ship… Powered by a cluster of four exhaust engines in the back surrounding a larger exhaust engine, the rocket-ship has room for a sole pilot—actually shown and included in the sculpture." He describes the pilot as sitting with legs folded toward his chest, and wearing a one-piece "ribbed pressure suit" which becomes boots at the feet, and gloves at the hands, and points out that since the pilot’s head is missing, we cannot know whether the pilot wore a helmet, goggles, or other headgear. The artifact measures 23 centimeters long, 9.5 cm high, 8 cm wide, or 5.7 inches long, 3.8 inches high, and 3.5 inches wide. 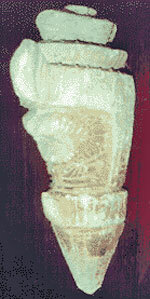 Sitchin spent years tracking down the artifact, until he located it at the Archaeology Museum in Istanbul. It was excavated at Toprakkale, a city known in ancient times as Tuspa, where the kingdom of Urartu reigned briefly over 2500 years ago. The museum curators decided this small artifact must be a forgery because it differs from the era’s style, and more importantly, it looks like a space capsule. They reasoned that since there were no space capsules in ancient times, it must be a modern fake, a practical joke, made of plaster of Paris and marble powder. 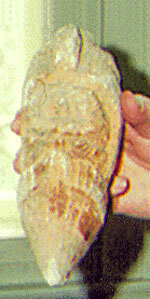 from "De Goden en de Broederschappen"
However, during Sitchin’s visit to Istanbul and the Museum in September 1997, he met with the Director, Dr. Pasinli, who took the artifact from a drawer, and allowed Sitchin to examine and photograph it. It looked to Sitchin to be carved from a porous, volcanic ash stone, the details very precise. Dr. Pasinli asked Sitchin what he thought. It is not out of context, Sitchin told the Director and his colleagues, when you view various artifacts that also seem to represent an ancient, space faring civilization. In Sitchin’s "The Lost Realms," you’ll find illustrations of artifacts that may represent bearded spacemen and rocket-ships from Mexico, and from Lebanon, what might be a rocket-ship on a landing platform. He advised the Museum directors to allow viewers to decide for themselves what it is, while stating their own doubt about the artifact’s authenticity. This was enough to convince the curators to finally put the object on public display. Be sure to have a look for yourself next time you are in Istanbul. Update: The Three Thousand Year Old Space Module Was 25 Year Old Plaster!